These tasty pretzel dogs beat any traditional pigs-in-a-blanket that we've ever tried, and they're so much healthier, especially if you choose to use soy dogs instead of regular. 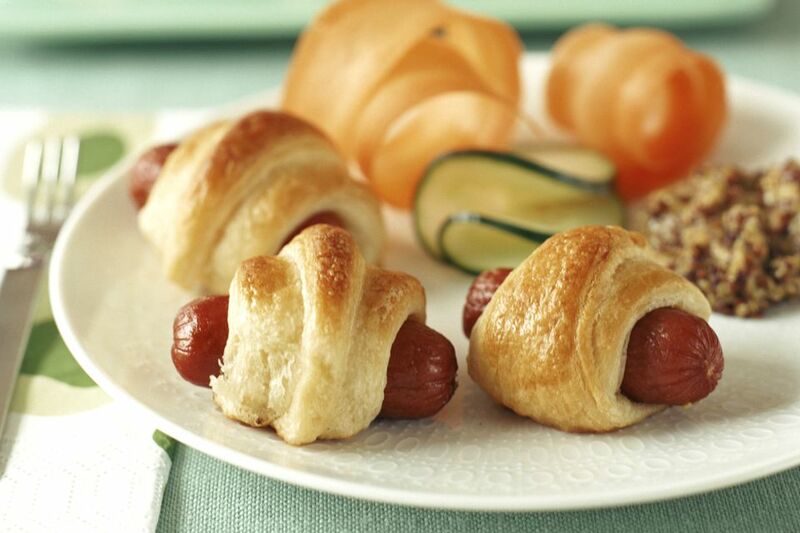 This recipe makes "mini" pretzel dogs to be served as appetizers or meals for kids, but feel free to wrap and bake full dogs if you're serving them as a meal for teens or adults. In a large mixing bowl, combine the yeast, warm water, and sugar, agitating until the yeast is dissolved. Let stand for 5 minutes, or until the mixture is bubbly. In another bowl, combine the flour and salt. Add the flour mixture gradually to the yeast mixture until forming a soft dough that is neither sticky nor dry, adding extra flour if necessary. Turn the dough out onto a clean work surface and knead until elastic and smooth, about 3 to 4 minutes. Place in a lightly oiled bowl, cover, and let rise in a warm place for about 1 hour or until doubled in bulk. Preheat the oven to 425 F. Lightly oil a large baking sheet and set aside. Punch down the dough and turn it out onto a lightly floured work surface. Using a rolling pin, roll the dough out into a rectangle about 1/8" thick (the longer and thinner the rectangle, the better). Using a pizza cutter, cut the dough into triangles each about 3 inches wide at the base and 4 inches long. Place a hot dog or soy dog half at the base of one of the triangles perpendicularly, and then roll the dough up to the tip. Press the tip gently into the dough to secure the roll and place the roll on the prepared baking sheet. Continue until all of the dough or all of the dogs have been used. Lightly brush the rolls with soy milk (you probably won't need the entire 1/4 cup) and sprinkle with coarse sea salt if desired. Bake for 12 to 15 minutes, or until the rolls are puffed up and golden brown. Transfer dogs to a wire cooling rack to cool slightly before serving. Serve hot, at room temperature, or cold. Did You Know You Can Make Vegan Cookie Dough Ice Cream?